Well this week dealt a big blow to my usage totals but all for a good cause. I went shopping yesterday with my friend LeeAnn to find fabrics for the quilt I'm making her. We found some gorgeous fabrics (after stopping at 3 different quilt stores). It's going to be a king-sized quilt so of course it required a lot of fabric. For the top alone, we bought 16.25 yards! LeeAnn is going to wash and iron it before returning it to me so I don't have a picture of it. While we were trying to find the perfect fabric combination, I ended up with a few samples that were eventually ruled out. So these 3 fat quarters will make there way into my stash for some future project. That brings my fabric intake this past week to 17 yards! That's a lot of fabric. And as for what I used - not nearly that much. I finished my Supaida quilt last week. I used 1.5 yards for the backing, binding and label. 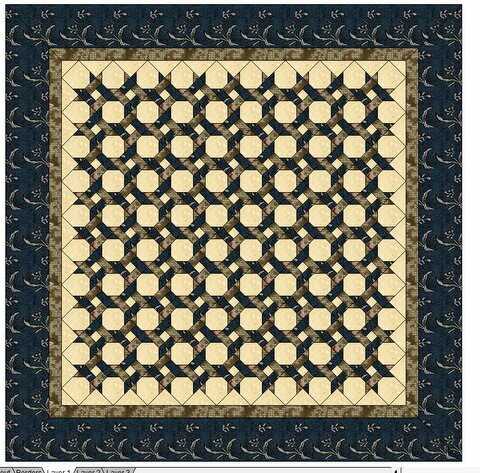 I also used another half yard for the first 3 blocks of my Bee Sampler. But that's about it. "I don't want your sacrifices - I want your love; I don't want your offerings - I want you to know me"
That quilt looks like the cane seat on a chair . . . it's very striking. What is the name of the pattern? There are 2 alternating blocks in the quilt: a snowball block and a twisted rope block. Your numbers are great! I adore the picture you have at the top of your blog. 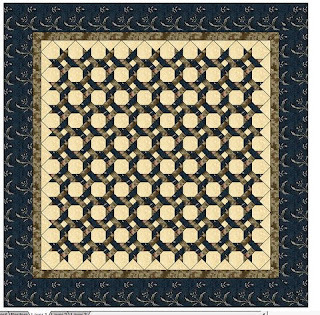 Your EQ quilt is going to be stunning. Isn't it fun to see our fabric selections before we even put in all the work of cutting it up? !